If your company sells any type of product, then acquiring a Las Vegas/Clark County Product Liability Insurance policy is an absolute must when creating your business plan! Whenever they present the list of states where new businesses are created, one state that continuously stands out is Nevada, which is almost always near the top of that list. Now, quite a few of these new companies will sell some type of product, whether it will be from their own storefront or through their website, and, in some cases, from both. Considering how easy it is, and considering that creating a website is fairly simple, no time in history has it been more affordable or easy to start a new venture. Selling a product is a favorite of new entrepreneurs whose products range from medical, home goods, food, cleaning supplies, hair products and make-up, to one of the many products created each year to make our lives better. If your company sells any type of product, then acquiring a Las Vegas/Clark County, NV Product Liability Insurance policy is an absolute must when creating your business plan. When going over a Product Liability Insurance policy with potential clients, many times, they say they can’t imagine that their product could ever cause serious harm and feel that this type of insurance coverage isn’t really necessary, but nothing could be further from the truth. If you have a Las Vegas/Clark County, NV business with plans to develop and market a product, then having a Product Liability Insurance Policy is in your best interests. Please be aware, it really doesn’t matter where in the product chain your company is, when a customer firmly believes they were harmed by the product they bought, they will target every company that is associated in any way with this product and could saddle your company with not only an expensive and very time consuming lawsuit, but if they should win, with a costly settlement. When discussing this type of claim, usually it refers to how the product was designed in the first place. A common example of this type of claim would be automobile manufacturers. I am sure that most of you have noticed some of the warnings they have on the side of products and say to yourself, “Wouldn’t common sense tell me that?” Well, the severe legal risks that could happen from the potential dangers that the consumer may suffer is the reason. Because of this, these types of claims are being filed more frequently these days, and now you are seeing more companies putting very detailed warnings on their products. This particular type of claim usually involves a product that is defective as a result of the company’s production process, thus making the product unsafe. We make it a point to remind our clients that even if they took every reasonable precaution they could think of, there may be a situation which occurs that will cause a customer harm, which could lead to your company to be held liable, thus, the need for a Las Vegas/Clark County, NV Product Liability Insurance policy. In acquiring a Product Liability Insurance Policy, the insurance carrier has a duty to defend your company should a claim occur, including costs associated to investigating the claim, and pay out any settlement or judgment that is made against your company up to the limits of the insurance policy. In determining premiums for this type of insurance coverage, there is no set rate table due to the fact there are so many variables to consider, such as the type of product you are manufacturing, marketing, or distributing. Lower premiums will apply to those types of products that pose a low rate of harm or damage to the customer, and, of course, the higher risk to the customer concerning a particular product will result in a much higher premium considering the bigger risk the insurance carrier is taking. 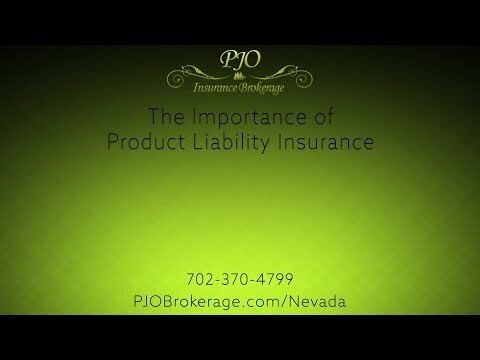 If your Las Vegas/Clark County, NV company is developing a product, distributing a product, or selling a product, PJO Insurance Brokerage has the expertise and experience to help you put together a business insurance plan to suit your company’s product liability needs.